Since Scotland we really haven't been having much luck with the weather. This was another weekend where the forecast was dodgy, so in the interests of doing something we opted for a Jura hike. The thought was to reproduce part/all of the long walk we did a couple years ago. Starting in Delemont we walked through town until hitting the hiking path up onto the ridge. From there we head up, up onto the ridge and then continue along. The conditions really aren't great, it's not quite raining but it is really misty, the path is at times quite muddy, definitely not ideal. After a good stretch along the ridge we decide to call it a day and turn down towards Unterwiler and the Baerschwil Station. 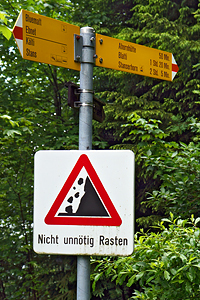 Down, down we go, through Ober- and Unterwiler, where we miss an unmarked(!) turn off down to the station and end up continuing an extra km along the road to Liesberg before realizing our mistake. Now we aren't going to be able to make the bus, so we stop at a nice bench to eat something, enjoy the view across the valley, and rest a bit. This gets cut short when we see rain coming from the West. That gets us on our feet and moving back down the road, looking behind to see how quickly the rain is gaining on us. At the unmarked(!) turnoff we head down through the woods until hitting the train tracks and river at Baerschwil Station. We still have some time before the bus, so we're happy to find a cafe/restaurant near the bus stop that's open. It's basic (and very local), but it gets us out of the rain and they have cool beverages for us.